Crochet is different than knitting in many ways. One way that isn’t mentioned often is that the hook size is not as important in crochet as knitting needle size is in knitting. That is because in crochet after the loop leaves the hook it can still be adjusted longer of shorter as desired and does not need to match the preceding stitch. I am making some flowers for another doily that each stitch needs a slight adjustment so the edge of each petal curves just so. It is time consuming to say the least. 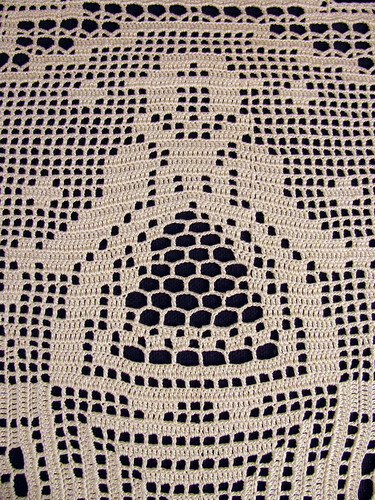 Another type of crochet that the stitches need adjustment is in filet crochet. To keep the boxes square the stitches need to be pulled slightly longer, otherwise the mesh isn’t square but rectangular. This filet doily has lots of pulling going on. Since it is worked in the round the four corners distort, as I showed on the little pineapple square I posted a while back. The distortion actually helps the skirt of each girl though, because the open stitches allow the upper and lower block stitches to curve in a realistic manner. However it is difficult to keep the outside edge corners right angles without using a lot of starch. 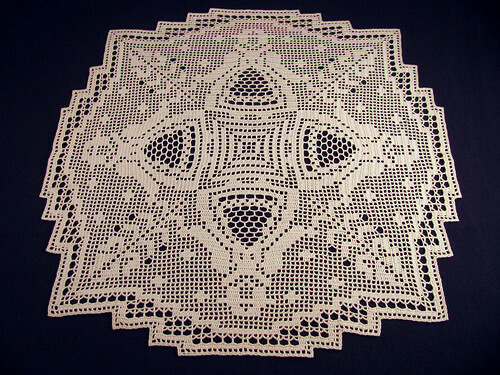 The doily is worked in the round, but I turned the work after each row. That way the edges worked back and forth match the interior of the doily. Most people don’t realize the amount of thought that goes into doily making. A close up of one girl. This entry was posted on Sunday, February 15th, 2009 at 3:00 am and is filed under Crochet. Tagged: Crochet, Doily, Lace, Thread. You can feed this entry. You can leave a response, or trackback from your own site.